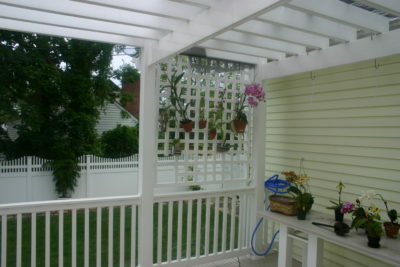 Phoenix PVC Pergolas can be used for shade, hanging plants and even as an extension of your living space. 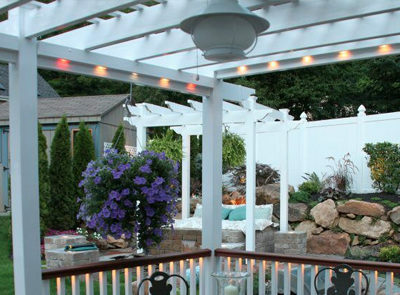 Be as creative as your imagination allows and design the pergola of your dreams! We will work with you to make your vision a reality. 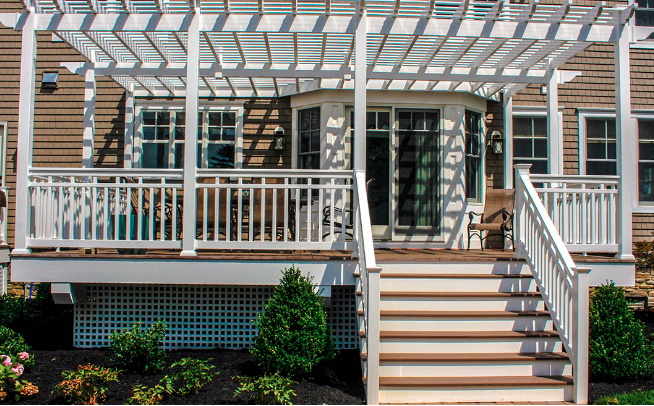 PVC pergolas are a smart choice for those who want to add that special accent to their homes. 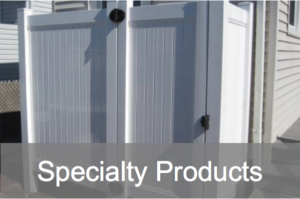 Our materials are strong and require almost no maintenance. They are made with durable PVC which will never rot, crack, fade, split or warp. Our PVC has the maximum amount of TiO2 sun protection to keep them from fading or discoloring. It will never yellow – it’s guaranteed! 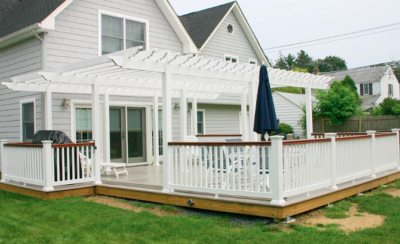 Phoenix is proud to present a new premium line of INTEX Cellular PVC Pergola Systems. 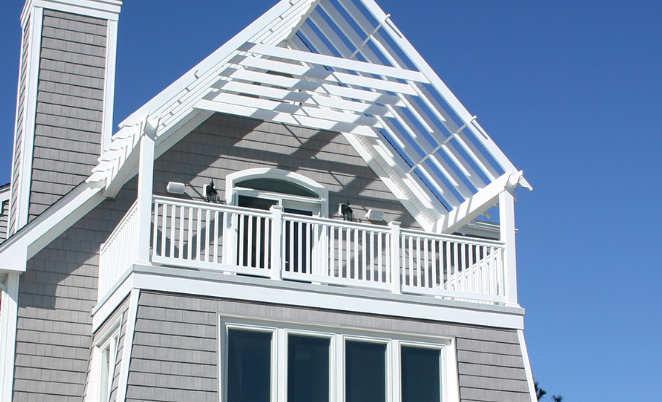 Extruded cellular PVC materials are exceptionally strong and durable and combine the maintenance-free features of vinyl rail with the upscale matte finish look of painted wood. 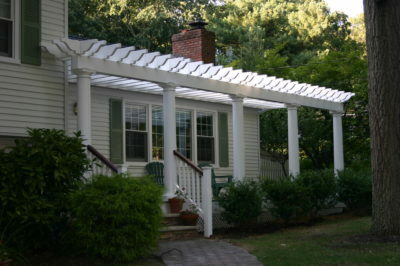 These pergolas have all the same benefits our cellular PVC railings have. Light up your pergola with the same sophistication and elegance as the patented Phoenix Ambience Rail® System. 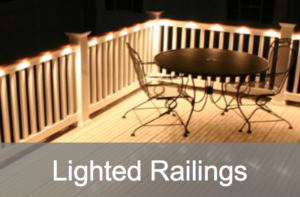 Ambience Pergola® Kit is a 2×3.5-inch add-on rail that integrates low-voltage LED lighting. It can be attached to beams or end rafters to illuminate your pergola without any visible wiring, exposed lights or harsh spotlights from above. 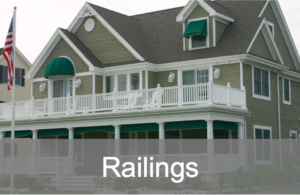 Use as many rails as you want; kits come with all the parts needed for an easy installation. Every lasting impression is in the details, so accessorize, accessorize and accessorize! 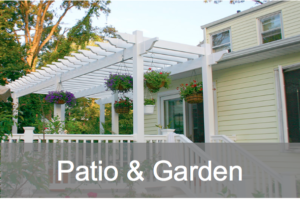 From flower screens, decorative support arches and keystones to waterfalls and outdoor ceiling fans, Phoenix offers a variety of unique and beautiful pergola and garden accessories to help complete the look of your outdoor space. Let us help you get your backyard picture-perfect and party-ready! 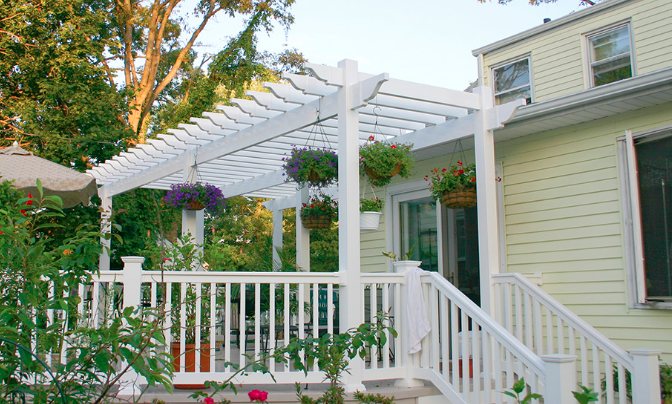 Check out the inspiration gallery for pergola accessories. Measurements are center to center. Be as creative as your imagination allows. 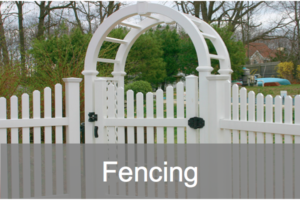 Phoenix has all the parts and components to build your own freestanding or attached pergola.